WC DriveCraft - Airplanes, Helis, Cars, and Trains for MC (models only - help needed! You know what I truly miss from the 1.7.10 days? 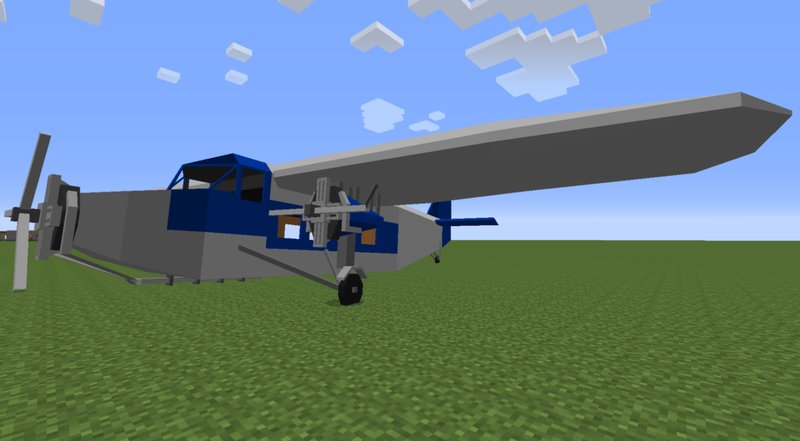 Flan's Mod and Minecraft Flight Simulator -- two of my all time favorite mods -- which sadly never made it to 1.11.2 or beyond. They both have awesome features; their own strengths and weaknesses. Wouldn't it be great if there were a mod that took the best of both worlds and combined them? Well, that's where I'm hoping DriveCraft will come in. DriveCraft will (hopefully) be a mod that features cars and trucks, (prefab) ships and submarines, and flyable planes, helicopters, and airships. It'll also feature a simplified train system loosely inspired by "Railcraft" and "Rails of War", with larger models and connectable cars running on your existing vanilla tracks, all without over-complicating things with tons of new machinery and whatnot. Last year and early this year I was working on a Flan's Mod content pack for 1.7.10. It's finished, but I really want to move into 1.11.2 (and later, 1.12). So I thought I would create this WIP thread and see if anyone wanted to help me bring these models into 1.11.2 and beyond. 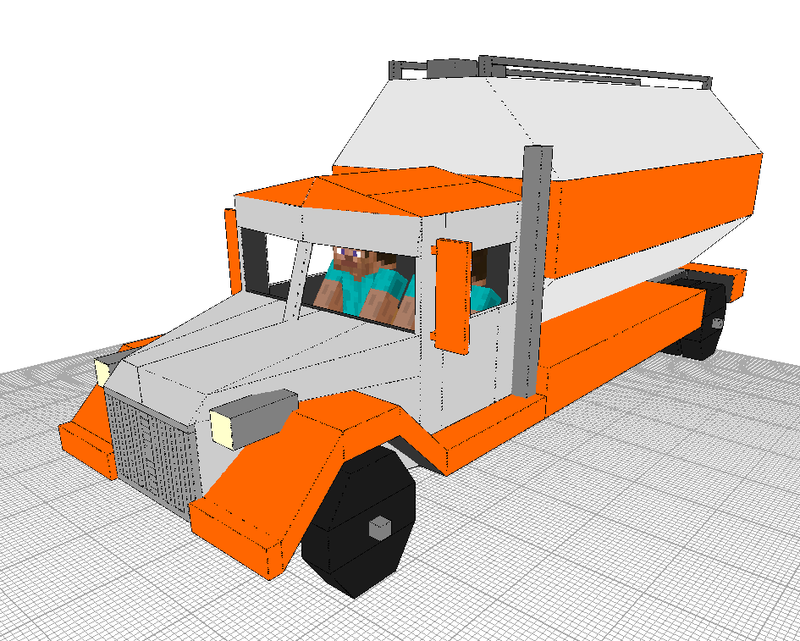 These models would be the foundation for this mod; they're civilian cars, trucks, airplanes, and helicopters. I'll model trains, airships, naval ships, and submarines if someone agrees to help with this project. What I need is a few partners in crime. Someone who knows Java super well (or even MCreator? Is this too big a project for that?) and perhaps someone who can retexture my models so they stink 70% less than they stink now (Note: I very much want the textures to look good in MC without a texture pack installed; they need to fit into the visual theme of vanilla MC). I want this in 1.11.2 because that's the version I'm playing currently, and I'd like to update it to 1.12 too. Any other versions this mod is added to is entirely up to the coder(s) and they can backport it as far as they feel like backporting it. Here are a few of the models I've made. Counting all of the color variations I had made, the pack had something like 100 vehicles in it (around 20 planes, 3 helis, and the rest were cars/ trucks). I think it would be wise to start out way smaller of course, with the best three or four vehicles from each category, and expand later. I can export these as .OBJ files upon request. Hanks 49, which was based on an amalgamation of late-40's sedans. 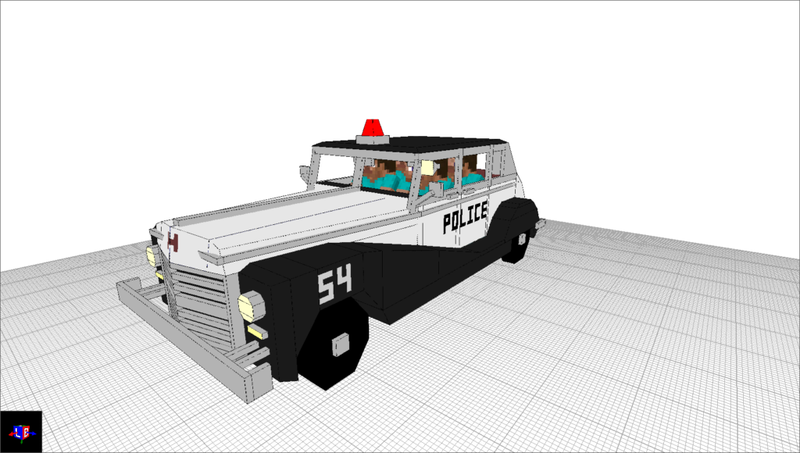 This is the police variant. There are also civilian sedan and taxi cab variants. Coleman Yellowtail, based on the Piper Cub. A very simple two-seater airplane ideal for training pilots, but also used heavily as a bush plane. That should give you the gist of my modeling talents (whatever small amount I have, anyway). I want the models to look like they "fit in" with Minecraft, but without being hideously blocky and terrible; these have shapes, but retain some blockiness. There are a lot more vehicles but this is just a small sampling of them. Beyond modding, I will also be developing a website exclusively for this mod (and any other mods we make in the future if we decide to do so) and writing a full Wiki for it. I'll also host the mod on a public server with other mods we dig. A list of features I'm hoping we can add to the mod. Some I'm adamant about, others, eh, no biggy. If a coder wants to add anything not on this list, I'm almost certainly cool with it, as long as it stays true to the theme of the mod of course. - Liquid fueled everything! Vehicles all use a liquid fuel, oil, and coolant crafted with vanilla recipes. If Buildcraft, Immersive Petroleum, or other mods are installed, Drivecraft will use those mods' materials (BC oil, BC Fuel, IP Gasoline, IP Lubricant, etc.) and the vanilla recipes will be disabled entirely. - Vehicles use more fuel the more you accelerate. They always use at least a tiny bit of fuel when idling with engines on. - Unique crafting benches for this mod; some way of building a chassis, a table just for engines, etc. I have ideas on vehicle assembly but we can chat about that privately. - All vehicles have acceleration, top speed, handling, and fuel efficiency variables which can be adjusted in the vehicle's config. - All vehicles (land, sea, and air) will have a GUI while operating them which displays a speedometer and an odometer that shows how many meters (blocks) and kilometers total the vehicle has driven. They will also have a fuel gauge. An oil pressure warning light will come on if the oil is low. A temperature warning light will come on if the coolant is low. And if the engine takes too much damage (25% or more), a check engine light will come on. - Wishlist: The ability for other players to create their own content for the mod, like a Flan's content pack, supplying their own models and configs. - Wishlist: Vehicles crashing with a lot of force should explode. The more fuel they're carrying the bigger the boom! - Cars behave quasi-realistic, but in a Minecraft-friendly way. This doesn't need to be super complex and can work almost identical to the way Flan's mod did, but I do want a different acceleration/ deceleration system so vehicles behave a bit more like proper vehicles. - Pressing a button activates the "metro speed limiter," which limits a car to twice a player's running speed (running speed * 2). For use in metro areas/ cities. If you've ever used Flan's Mod civilian vehicles on a server you'll understand why this is so important. - Vehicles have a horn. Police cars, ambulances, and fire trucks substitute a horn for a siren. 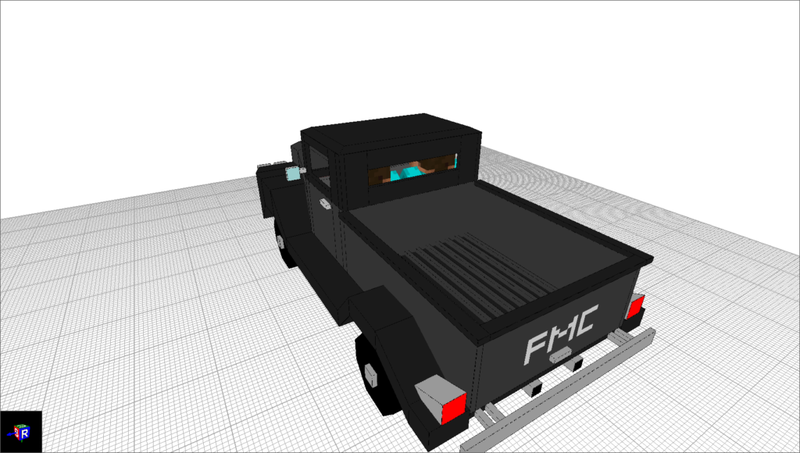 - ALL vehicles have cargo space. 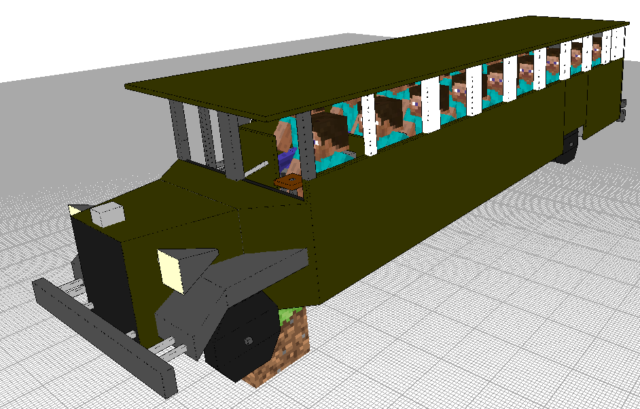 I'd like this to be accessible by all players by right-clicking the trunk/ boot, and each vehicle would have its own unique cargo capacity based on the type of vehicle it is. Trunks can be locked so players can't steal your stuff. - I'd love to stick mobs in the backs of pickup trucks and carry cattle, sheep, etc., including modded mobs (Animania animals, for instance). While holding a lead attached to an animal, right-click on the truck and the animal is loaded up. Right-click the animal with a lead again to dismount them. - If possible, I'd like 18-wheelers to bend properly and have detachable trailers that can carry items, animals, and fluid, depending on the type of trailer it is of course. - If possible, I'd like cars to occasionally "skid" when driving on ice and snow, with a randomized pull to the left or right, and a sliding quality to the vehicle's handling, all to emulate losing control in bad weather. Maybe this could happen to some lesser extent when driving rain/ storms? - Planes can have "cartoony flight" like Flan's had; we don't need some complex simulation here. But there would be a few changes, as detailed below. - If an airplanes engines die or the plane runs out of fuel, it should coast like a real plane, losing speed over time. That's as complex as I'd ever want the physics in this mod to get. - Climbing should tick away at speed, while diving should increase speed. - Once an airplane has taken off, reducing speed below takeoff speed enters the plane into "stall mode," where it will lose altitude rapidly if the situation isn't fixed. A plane reenters taxi mode once it has come to a complete stop, allowing you to land safely and then taxi around the airport. - Airplanes have "loading doors." Right-clicking the plane at a loading door will move you into the plane and put you into the next available seat. This will allow players to build realistic airports, pull up to terminal gates, load their passengers, and pull away (with the push back feature). To quote Direwolf 20... Nifty! - Airplanes can be auto-loaded by "baggage car" vehicles. The baggage car driver will have buttons (or something) that auto-load and auto-unload planes. - The limiter button from ground vehicles sets the plane to "cruising speed," which is 70% of its top speed. - Players seated in designated co-pilot's seats can take control of the airplane if the pilot hands control over or exits the pilot's seat. Have you ever accidentally bailed out of a Flan's Mod airplane and left your friends to crash into a mountain and die? Yeah... this stops that from happening. Sorry again guys. - If headlights are possible, (some) airplanes would have landing lights, which are super bright and shine out as far as we can make them go. - If possible: I'd love a "crop dusting" feature where the planes spray some mixture of bonemeal, water, and charcoal. Handy for those of us who build huge farms! - If possible: I'd like to incorporate a "localizer system." Place two "Localizer" blocks at two ends of a runway at the same exact Y level, in the tarmac (the tops of the localizer blocks would look like tarmac, a block we'll add, so they can be well hidden). Name both localizer blocks the same thing (for instance, name them both "Notch International Airport"). When flying, pilots can turn on localizers, which will show big green beacons coming up from the ground at both ends of the runway, which helps them line up for a landing and know what altitude they're landing at. Also displayed is the airport name (as written in the localizers), the altitude (Y level) of the runway, and the distance to that runway. This will allow pilots to land at airports. You can set localizer blocks as "private" so that only you can see them, if you want to prevent other players from landing at your runway. Only pilots who've activated the localizer system can see these beacons; they're invisible to everybody else. - If possible: A Radar array that detects all aircraft of all types within 5 km of that array, and transmits their direction and altitute info, along with the airplane's short name, to a radar screen within 100 blocks of the array. Useful for air traffic control towers. - I like how airships handle in ViesCraft, but they're too small, too slow (even upgraded), and not really tough enough for the rigorous commercial flight I plan on exposing these vehicles to. - Trains need horns with an epic steam locomotive horn sound or why even bother? If you're interested in helping out, please note that I really want this project to be a team effort. I'm not looking for a temporary helper, more of partners who want to make a cool mod together and keep working on it after it's released. When it's done, I want to release this mod to the public and openly allow its use in modpacks for free, unconditionally. I'd love it if it were open source TBH but that's up to the coder. If you're down, please drop me a line and we can get started!